AN ATV WITH A DIFFERENT POINT OF VIEW. ARGO didn’t take the same route and follow the other ATVs. Our point of view is to give you more value straight from the factory. The XR 500 LE is well-equipped with standard features not found on other ATVs. High-quality functional features, include Innova tires, steel racks, a multifunction digital gauge, front differential lock and an anti-vibration 2" receiver hitch. ENGINE: The 503cc single cylinder 4-stroke engine feature Electronic Fuel Injection (EFI), single overhead cam and liquid cooling with an auxiliary fan that provides consistent performance in the most demanding conditions. This engine is clean and delivers class-leading horsepower and incredible torque. 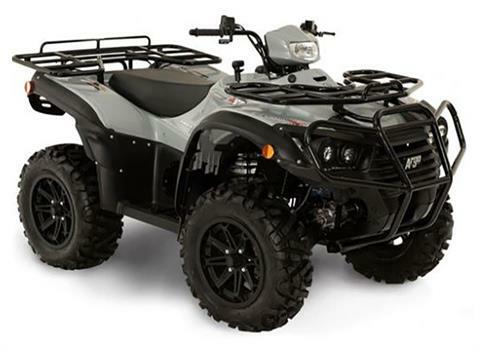 ELECTRONIC POWER STEERING: All conveniently set from the digital display, the Tri-Mode Speed Sensing Electronic Power Steering (TMSS EPS) not only senses the ATV speed for varying levels of assist, the rider can select no assist, minimum assist and maximum assist steering. SUSPENSION: Double A-arm front and rear suspension delivers premium comfort and control in all conditions. On all Xplorer models we mount the shocks to the lower A-arm for maximum shock performance and a wider range of rider comfort. Fine-tune the suspension for individual riding styles and load carrying with adjustable coil-over-spring settings. STEEL FRONT & REAR RACKS: Heavy-duty front and rear racks outperform composite racks and are easy to secure large loads with 165 Ibs. capacity on the rear and 99 Ibs. up front. INSTRUMENT GAUGE: Digital display features odometer, speedometer, trip odometer, RPM, EPS setting and fuel level. Surrounding the display are easy-to-identify indicators for transmission position, high temp, low battery, high beam, low oil pressure, check engine, 2wd/4wd and differential lock indicators.